When Gloria and Richard participated in a Connected Horse six-week session it was not about a wild riding adventure; they did not even climb on the horses. The experience was about connecting with a non-judgmental equine, and sharing a moment of peace - even enlightenment - with the animal and each other. The couple, one of whom is dealing with dementia, found a place to be present together and happy. 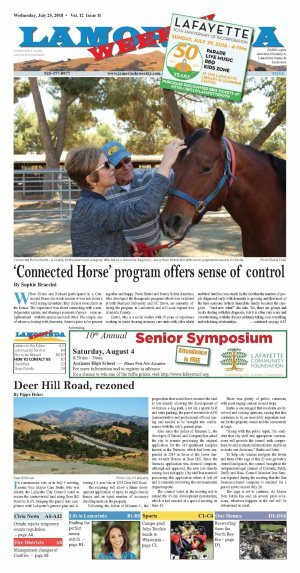 Paula Hertel and Nancy Schier Anzelmo, who developed the therapeutic program which was validated at both Stanford University and UC Davis, are currently offering the program in Lamorinda and will soon expand it to Alameda County. 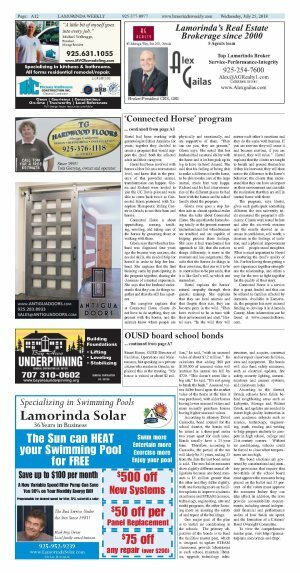 Hertel, who is a social worker with 30 years of experience working in senior housing memory care units with older adults and their families, was struck by the fact that the number of people diagnosed early with dementia is growing and that most of the time someone in their immediate family becomes the caregiver. "And now what?" she asks. Yes, there are groups and books dealing with this diagnosis, but it is often very scary and overwhelming, with the disease suddenly taking over everything and redefining relationships. Hertel had been working with gerontologist Schier Anzelmo for years; together they decided to create a program that would support the dyad: both the affected adult and their caregiver. Hertel had been involved with horses all her life on a recreational level, and knew that in the presence of that powerful animal, transformation can happen. 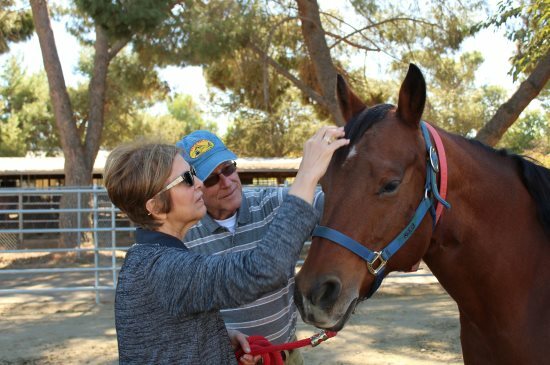 Gloria and Richard were invited to join the UC Davis pilot and were able to come back twice as Connected Horse partnered with Xenophon Therapeutic Riding Center in Orinda to use their barn and horses. Connected Horse is about approaching, sensing, touching, smelling, and taking care of the horses by grooming them or walking with them. Gloria says that when her husband was diagnosed four years ago she became very anxious, she needed skills, she needed help for herself in order to help her husband. She explains that the first blessing came by participating in the program together, sharing the closeness of a mutual experience. She says that her husband understands that they can do things together and that she still has a partner. The caregiver explains that at Connected Horse clients do not have to do anything, they are present with the horses, and the animals know where people are physically and emotionally, and are supportive of them. "They can see you, they are present," Gloria says. She noted that her husband had a natural ability with the horse and it let him pick up its leg to have its hoof cleaned. She said that his feeling of being able to make a difference for the horse, to be able to take care of the large animal, made him very happy. Richard said he had clear memories of the different places he had been with the horses and he talked fondly about the program. Gloria even goes a step further into an almost spiritual realm when she talks about Connected Horse. She says that the horses being totally in the present moment understand and feel when humans are troubled and are capable of helping process those feelings. She says it had transformed her approach to life, that she notices things differently, is more in the moment and less judgmental. She adds that the horses do things in their own time, that our will to be in control has to be put aside, that it is like God's will, to which one surrenders. Hertel explains the horses' natural empathy through their genetic makeup. She explains that they are herd animals and that despite their size, they can become prey in the wild. "They have evolved to be in tune with their environment and alert," Hertel says. "In the wild they will mirror each other's emotions and they do the same with humans. If you are nervous they will sense it and become nervous, if you are relaxed, they will relax." Hertel explains that the clients are taught to breath and ground themselves if they feel nervous; they will then notice the difference in the horse's behavior; the clients then understand that they can have an impact on their environment and can take the realization that they are still in control home with them. The program, says Hertel, gives each participant something different; the two university trials measured the program's efficiency. Clients were tested before and after the six-week sessions and the results showed an increase in confidence, self-worth, a decrease in the feelings of isolation, and a physical improvement as well - people stood straighter. What is most important to Hertel is nurturing the dyad's quality of life. For her having them getting a new experience together strengthens the relationship, and offers a way for the two to fight together for the quality of their story. Connected Horse is a service that is grant funded and that can be offered to families affected by dementia. Available in Lamorinda, the program has now secured funding to develop it in Alameda County. More information can be found at www.connectedhorse.com.